City Council (DPRD)'s Commission A of Malang, East Jawa conducted work visit (kunker) to Jakarta Communication Information and Statistics Dept. (Diskominfotik).
" This kunker is done in a form of comparative study related information management in DKI"
In this work visit, legislative members conducted comparative study related information service in Jakarta Government. They also visited Jakarta Smart City. 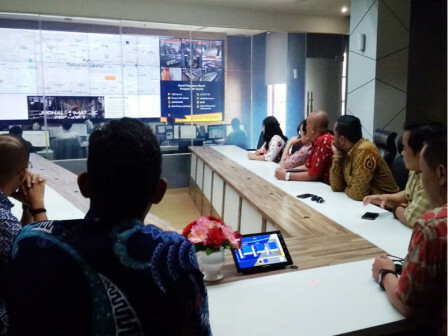 Malang DPRD's Commission A Head, Indra Tjahyono said this work visit was done as comparative study related information service system in Jakarta Government. He mentioned, Malang also has Ngalam Command Center as Malang Government's central information. "This kunker is done in a form of comparative study related information management in DKI," he stated, Thursday (8/30). He expressed that he is quite amazed and appreciate information service system and public service unit owned by Jakarta Government. "I hope Malang can learn and apply what Jakarta does," he added. Meanwhile, Jakarta Diskominfotik's Public Information Division Head, Raides Aryanto explained, his side gave information about Diskominfotik's service and work system in managing information in this kunker. "We explain about information service system and Jakarta Smart City work system in handling citizen complaints in this kunker," he conveyed. He hopes this study can be a reference for Malang development, especially in handling public aspirations in a good and faster way. "Besides, this activity can be a basis for Malang legislative and apparatuses to discuss Malang Kominfo Dept. 's budget," he said.